This sampler kit includes two economical imaging probes: 5(6)-ROX-RIS and 5(6)-FAM-RIS. Both probes are fluorescen conjugates of risedronate, a widely used bisphosphonate drug in clinical applications. The probes have different spectroscopic properties and can be used for optical microscopy imaging. This sampler kit includes two economical imaging probes: 5(6)-ROX-RIS and 5(6)-FAM-RIS. Both probes are fluorescent conjugates of risedronate, a widely used bisphosphonate drug in clinical applications. The probes have different spectroscopic properties and can be used for optical microscopy imaging. 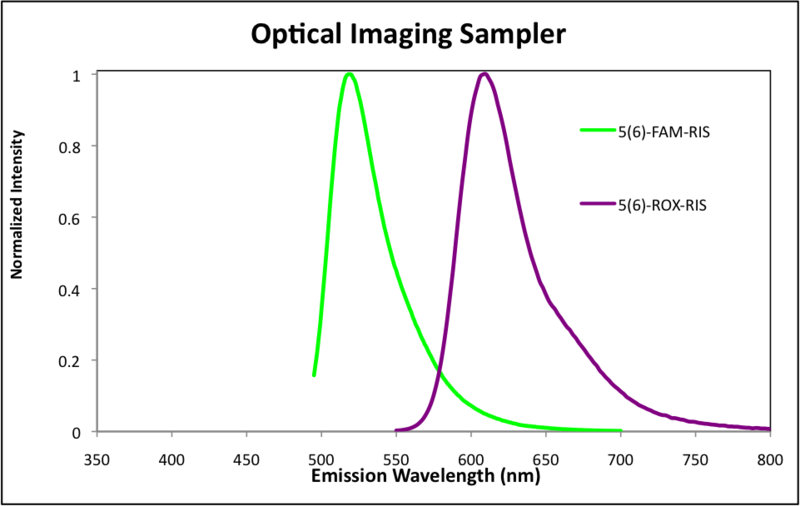 Emission spectra of 5(6)-FAM-RIS (in 0.1 M phosphate buffer, pH 7.2) and 5(6)-ROX-RIS (in 0.1 M phosphate buffer, pH 8.0) . Fluorescent risedronate analogues reveal bisphosphonate uptake by bone marrow monocytes and localization around osteocytes in vivo. Roelofs, Anke J.; Coxon, Fraser P.; Ebetino, Frank H.; Lundy, Mark W.; Henneman, Zachary J.; Nancollas, George H.; Sun, Shuting; Blazewska, Katarzyna M.; Bala, Joy Lynn F.; Kashemirov, Boris A.; Khalid, Aysha B.; McKenna, Charles E.; Rogers, Michael J. 2010, Journal of Bone and Mineral Research, 25(3): 606-616. Analysing the skeletal distribution of fluorescently-labelled bisphosphonates and lower affinity analogues in vivo. Roelofs, AJ, Boyde, Ebetino FH,A, Lundy, MW, McKenna CE, Blazewska, K, Sun, ST, Kashemirov, BA, Henneman, Z, Nancollas, GH, Russell RGG, Rogers, MJ, Coxon, FP. 2012 Journal of Bone and Mineral Res. 27(4): 835-847. Equilibrium-dependant bisphosphonate interaction with crystalline bone mineral explains anti-resorptive pharmacokinetics and prevalenc of osteonecrosis oft he jaw in rats. Hogoku, A, Sun, S, Park, S, McKenna, CE, Nishimura, I. 2013 Bone 53:59-68.